Whether ‘Existing Data’ should be a separate category? This divided opinion. Some felt it should be a separate category as it comes with its own set of issues, while others commented that it’s not relevant for everybody and in some cases could be artificial to separate from the broader data description. We were persuaded by the arguments for merging because they’re consistent with the overall goals for themes (i.e., streamline guidance, avoid confusion). Whether ‘Data Repository’ should be merged with ‘Preservation’? There was a majority decision to keep these themes separate, partly as repositories are about more than just preservation, but also to ensure that repositories remain clearly visible in the guidance as this is a common topic for researchers’ questions. We also have a number of machine-actionable use cases tied to repositories so it helps to keep this category distinct. Whether the various data sharing themes should be merged? Again there was a clear consensus here that the themes should be merged. You felt itwas confusing for researchers to have too many separate options and it could make the guidance unwieldy. We now have one theme that covers how and when data will be shared, including guidance on managing any restrictions. Other suggestions you made have caused us to merge ‘Data Security’ with ‘Storage and Backup’ and rename ‘Data Quality’ to ‘Data Collection’ so it covers broader concerns around data collection and organisation. There were a few requests to reinstate the ‘Project Description’ theme, but we felt this works better as metadata under the plan details rather than as a theme. As a final step, we significantly revised the guidance so this is more concise and directive too. Please take a look and let us know what you think! We shared the new revised themes with the Data Documentation Initiative (DDI) working group who we’ve been having calls with about standards for DMPs, and will push them out to other discussion lists soon. We will also implement the revised themes in the Roadmap platform in the new year. We’ve been working on lots of other topics in the meantime too. The developers have been busy migrating the database to a new schema and doing some refactoring. These changes will improve the performance of the tool so you won’t get the long page loading times we’ve sometimes struggled with, and will also support scalability as we’re getting increasing levels of use from around the globe. We’ll be giving a demonstration of the new DMPRoadmap codebase at IDCC and walking people through recent changes and new features. The demo will be part of a session in the main programme that will provide an opportunity to talk with the developers, hear more about our future plans, and share ideas from your DMP work. We are also coordinating a workshop on machine-actionable DMPs. There’s already been a lot of interest in this so we are running a waiting list. If you want to join us, please get in touch soon and let us know why you are interested and what inputs you could bring. We are trying to get a diverse audience in the room so we understand use cases from different perspectives and countries. Both of our teams will be enjoying a well-earned break over the Christmas holidays. Most of us are away from next week until 9th January so it may take us longer to respond to any queries in the coming weeks. We hope you all have a wonderful break too and enjoy the festivities. 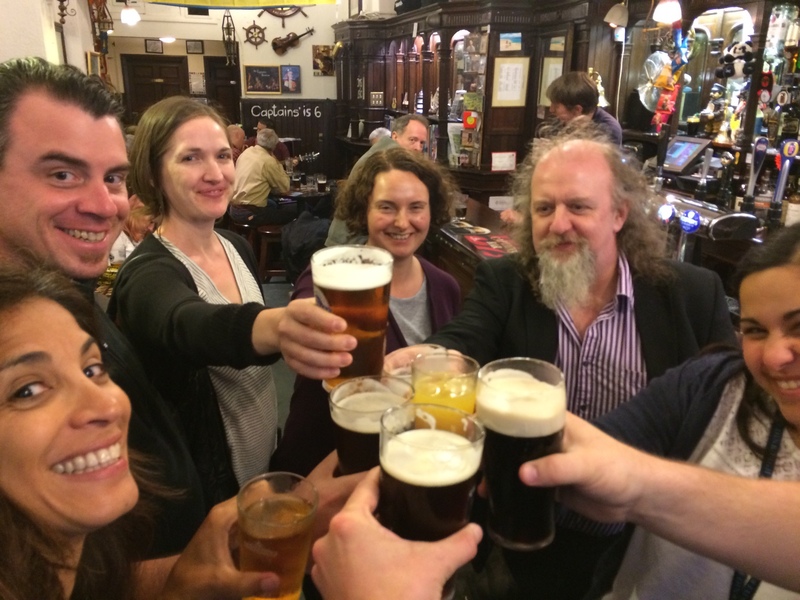 We raise a glass to you and more collaboration on DMPs in the future. Cheers! I’m interested in machine-actionable DMPs. I’m starting my PhD (few weeks), and my draft title is “Service Orchestration in DMPs” (https://twitter.com/ajspadial/status/816598574716878848). I wanted to set a formal description of DMPs at the very core of my work. Recently I knew about your work, the RDA IG group, and I’d like to participate or to know any related initiative. Good to hear you’re also interested in machine-actionable DMPs. We’ll be running a workshop at IDCC on this topic (see Stephanie’s latest post). It’s full now, but we will be sharing all the outputs and giving updates on this at future events. Watch here for more info to come.